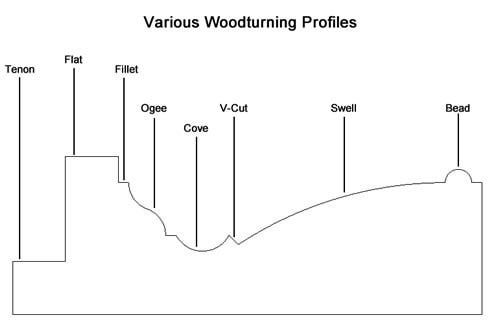 In woodturning,there are only a handful of basic profiles a woodturner would cut when turning spindles. As displayed in the image above, these basic shapes include Fillet, Cove, V-Cut, Bead, Ogee, Swell, Hollow, and Flat. There are only four different types of tools one would need to cut these shapes: the roughing gouge, spindle gouge, skew chisel and parting tool. Of course, there are a considerable number of variations on these basic shapes. For instance, the radius of a cove cut might vary depending on the desired profile. To create coves of different depths and widths, the woodturner would likely choose to employ different widths of spindle gouges, as a spindle gouge cannot cut a narrower cove than the width of the tool. A narrow spindle gouge can be used to cut a wide cove (as long as the woodturner has the requisite skill level), but a wide spindle gouge cannot be used to cut a narrow cove (as it simply won't fit into the narrow area). "Joining this club was one of the single best things I did to learn more about woodturning. The demos and interactions with other woodturners, from beginner to expert, have been invaluable." "I like having a place to meet with other woodturners and watch demos."